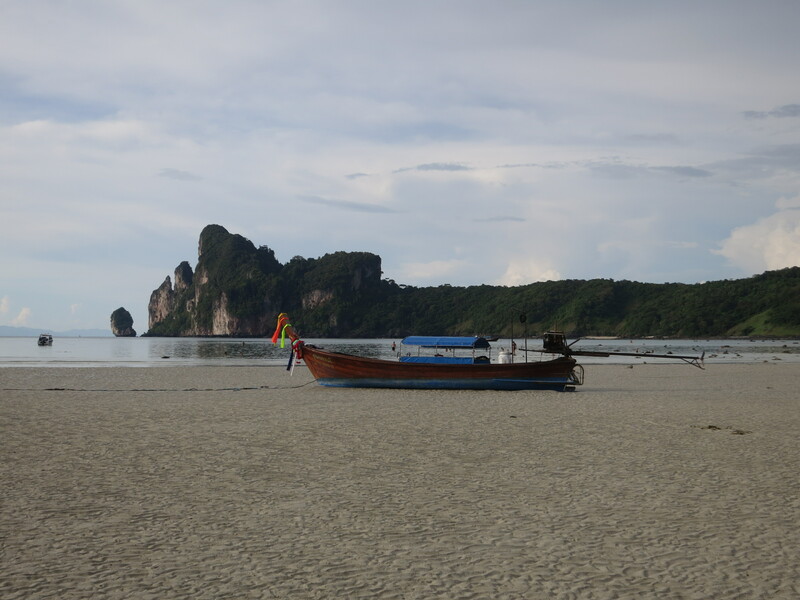 The islands in Thailand are about beautiful beaches. The iconic images are full of long stretches of yellow-white sand, generous expanses of calm blue sea, plenty of longtails (the boats), and, depending on the decorum of the photographer, quite possibly a bevy of bikinis. It’s also very popular, and a bit different from the sort of place we normally hang out on our travels. It’s a party island. 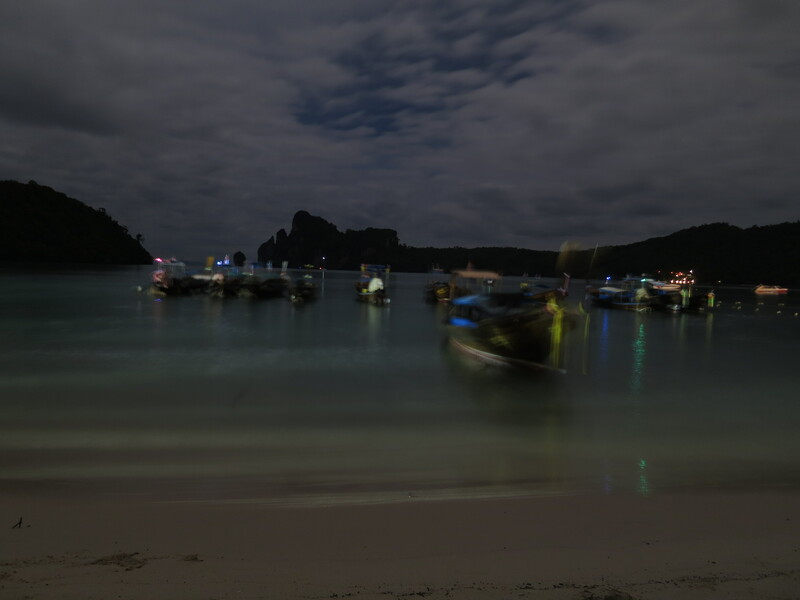 But we were on Ko Phi Phi Don for full moon, and there was still plenty of beach partying to mark the occasion. Much like when you were a little kid, the beach was full of people your age holding buckets. 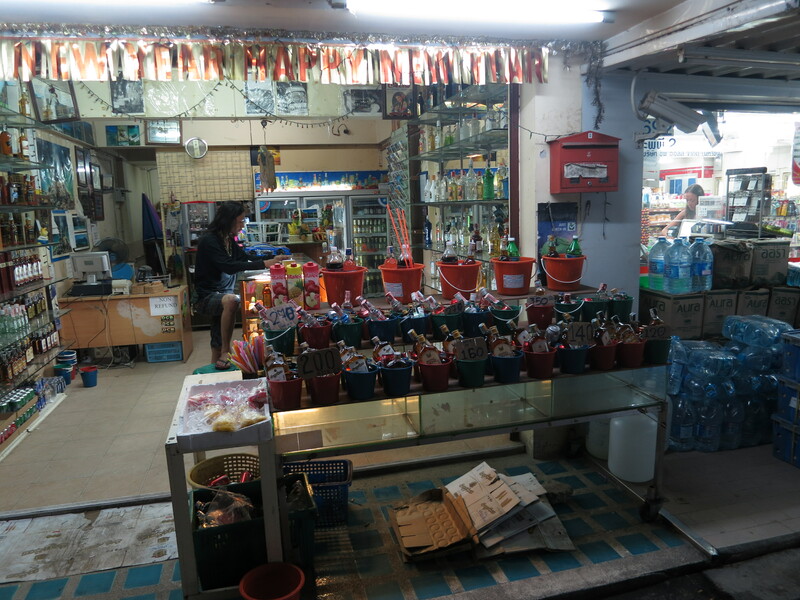 This time, though, they’re not for sandcastles, they’re for mixing the bottle of spirits your bucket came with into the bottle of soft drink you also got thrown into the bargain. 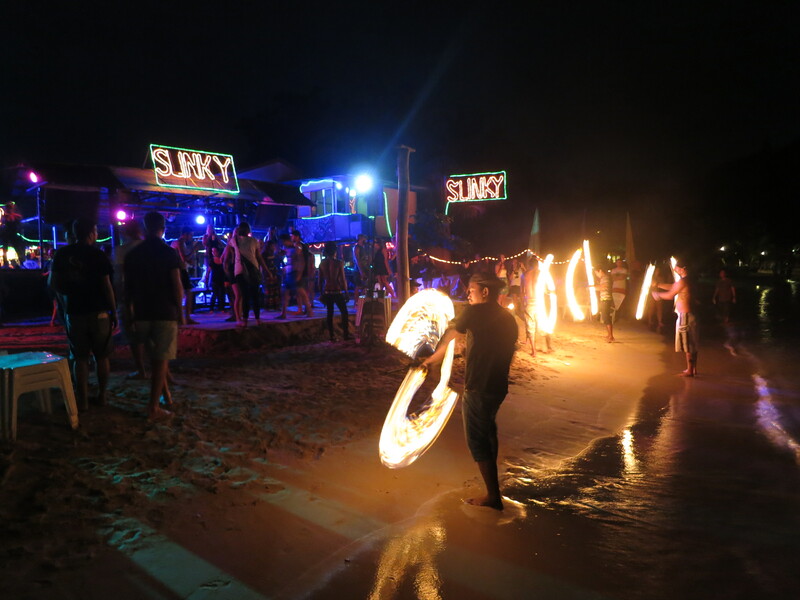 Then they’re for drinking from, via a straw, as you roam the beach watching people play with fire. Strolling the beach throughout the evening was entertaining, and only about as dangerous as you’d expect given the bucket situation (from which we abstained – a couple of beers did me just fine, thanks very much) combined with the fact that there are fireworks for sale to all and sundry, from stalls handily located next to the bucket sellers. And in fairness, I should also point out that it’s hard to complain about random people on the street being able to buy fireworks and accidentally shoot them at people when the bar owners who were setting off their own fireworks in some sort of professional capacity were not necessarily doing a much better job: we were up the very end of the beach at one point, taking long exposure photos back along the waterline, when one of the fireworks sputtered a little more slowly than intended out of its launcher and so didn’t actually travel quite as far as its own blast radius before it exploded. It was a bit warm, although thankfully the shrapnel managed to miss us. 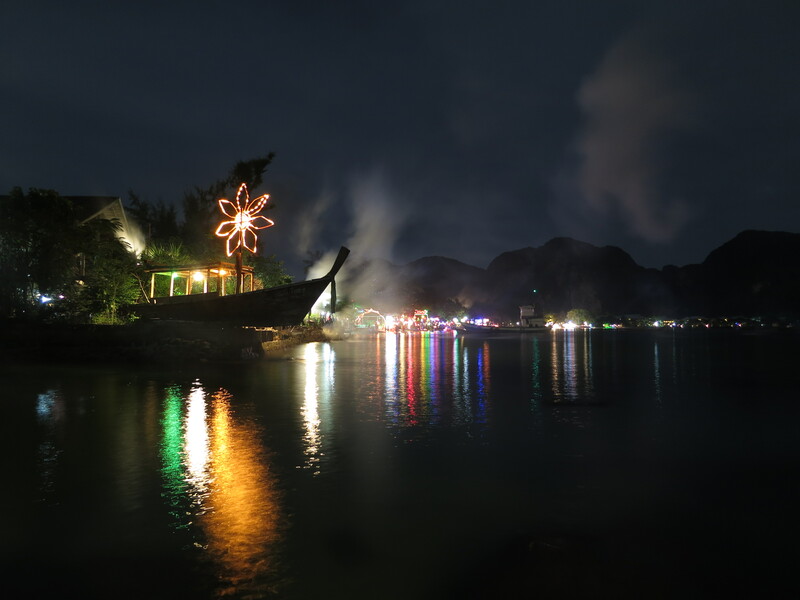 Loh Da Lum Bay (on Ko Phi Phi Don) at night, with the neon lights of its party bars lighting up the beach and bay. The smoke is from a very large firework which had just been set off. 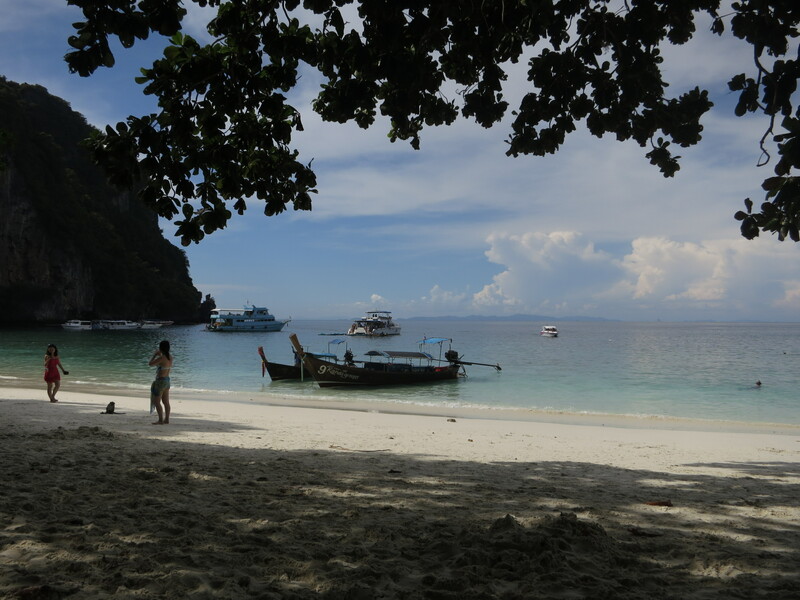 But anyway, evening drunkenness on the foreshore is not the only thing Ko Phi Phi Don has to offer. The non-full moon evenings are a little more subdued and make for some very attractive scenery as the longtails bob about on the waves in the still-quite-bright moonlight. And the island has some nice viewpoints you can hike between – including a track which runs right up to the north-east of the island, towards a partly-constructed resort village which seems abandoned, but for a few of the houses nearer the water – perhaps because of the financial effects of recent world crises, or perhaps because someone realised that they were already making plenty of money elsewhere on the island without needing quite so much capital investment as seems to have been poured in here. Some construction is still ongoing, though – we could tell there were people around when we heard concerned shouting and then muffled laughter from around the corner as someone accidentally tipped the truck they were driving onto its side. But other than that adventure, it was really all about the beaches. The best of which is Monkey Beach. We were told it was accessible either by longtail or by a track leading over the hill. We couldn’t find the track, so we just swam around the corner instead. 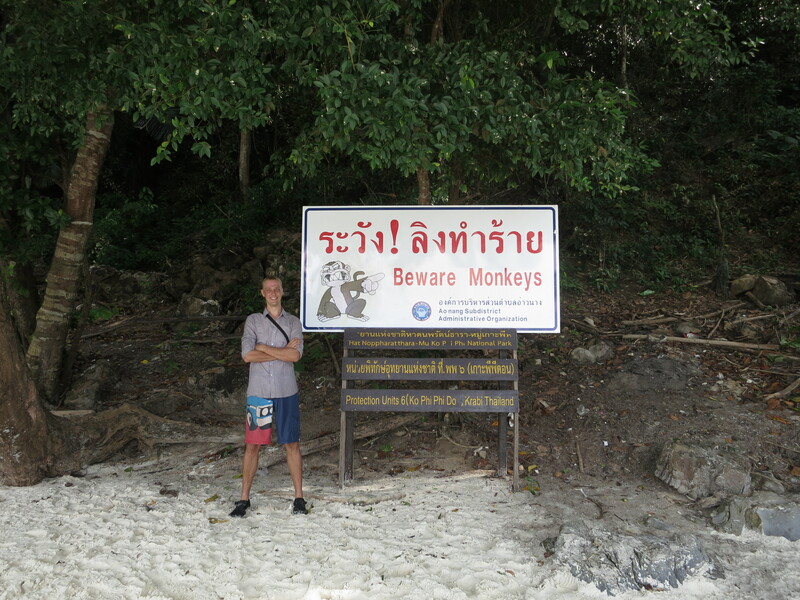 It’s a beautiful beach, and it comes with a free Family Guy sign warning of the monkeys after which the beach is obviously named. But even if you can’t be bothered making it around to Monkey Beach, there are still plenty of other bits of sand to enjoy. How much you explore the island is up to you. Pretty much wherever you go you’ll have no trouble finding a spot to install yourself for your afternoon of doing very little, watching the world go by. The firework thing had been a little annoying and more than a little alarming. And our time on the island hadn’t started well when our pre-booked twin bungalow turned out to be less twin and more a single double bed mattress, leaving us walking around the island in the driving rain finding somewhere else to stay. But no harm, no foul: there were no injuries, and we found a cheaper room that not only had two comfortable beds but cost no more and was better located. 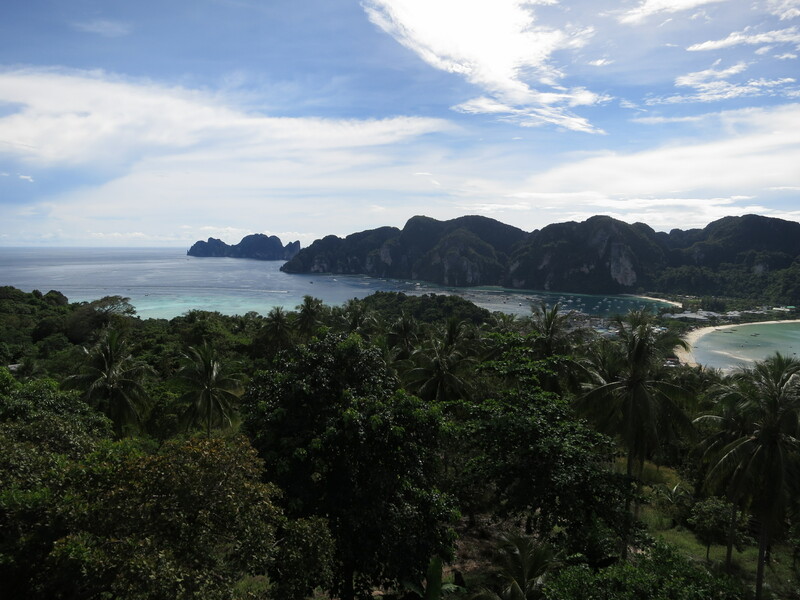 Our time on Ko Phi Phi Don worked out well. With a bit of forbearance and patience, travel generally does. 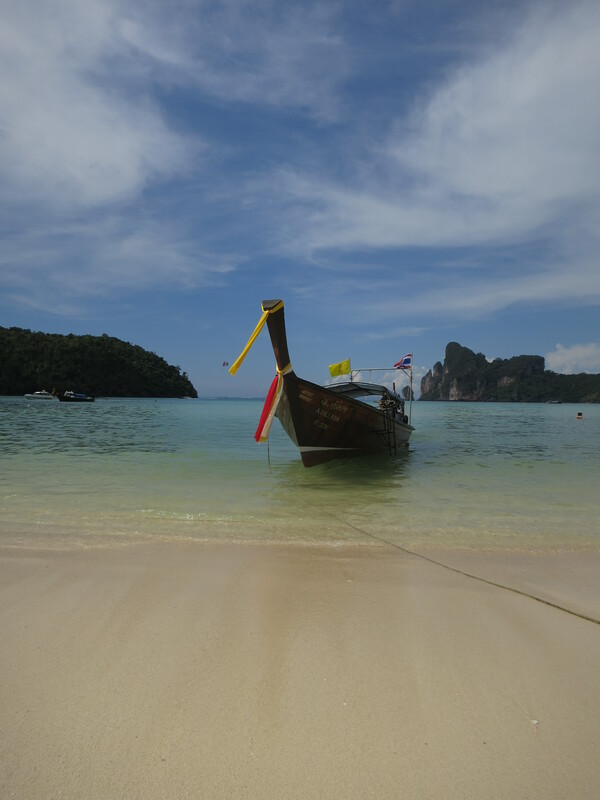 This entry was posted in Travel and tagged ko phi phi, thailand by Sam Roberton. Bookmark the permalink.